1980 Philadelphia Phillies Team Signed Majestic Cooperstown Collection Jersey (size XL). Signed by (20) including Mike Schmidt (inscribed MVP), Steve Carlton (inscribed Cy 80), Pete Rose, Bob Boone, Larry Bowa, Bake McBride, and others. "1980 Philadelphia Phillies World Series Champions" embroidered on front of jersey. Back of jersey is blank. Limited edition numbered 10/80. Jersey is framed to measure 41.5"x34". Includes COA from Hunt Auctions. $50 handling fee will apply to this framed item. 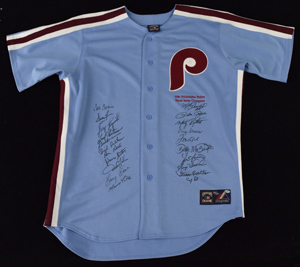 1980 Philadelphia Phillies Team Signed Majestic Cooperstown Collection Jersey (size XL). Signed by (20) including Mike Schmidt (inscribed MVP), Steve Carlton (inscribed Cy 80), Pete Rose, Bob Boone, Larry Bowa, Bake McBride, and others. "1980 Philadelphia Phillies World Series Champions" embroidered on front of jersey. Back of jersey is blank. Limited edition numbered 10/80. Includes COA from Hunt Auctions.